Thank you so much for introducing Westley to the many fun, creative activities he enjoyed in TechStars this year. Westley will be moving on to Pre-K at his big sister Alison’s school in September. Thank you Debbie for inspiring Nathan with the Tech Stars curricula. He looked forward to it every week and I am sure will miss it once we are in Australia. Keep on engaging and inspiring young minds the way you do, it is wonderful! Thank you. I just wanted to share Katie’s excitement with you on your class. She has been signing her new songs and wakes up everyone Wed morning to announce that it’s Tech Stars day! Thanks so much for instilling the love of learning into our little one! And I LOVE the selfie! It’s certainly going to make her baby book! We’re so sad Tech Stars is ending next week. We ? Ms Debbie so! But so glad to to have had experience. I’m going to investigate Mary Magdalen next year and see if I can’t convince them to get on board! Thank u so much, i appreciate u all so much! Thanks Miss Kathy. (My daughter) loved your class and she will definitely miss them. She has learned so much from Tech Stars! Her little brother is also at Tutor Time (he will be 4 in January) so we’d like to sign him up for classes when the time is right? Thank you, Miss Debbie! Haowei gets excited every Tuesday mornings when he gets in school and sees you. TechStars is his favorite class. Thanks for making it so fun! Your comments are so thoughtful. We feel as if we are in a position to reinforce the learning in your classroom. Nolan looks forward to being with TechStars on Wednesdays. We miss you all and the folks at Tutor Time. 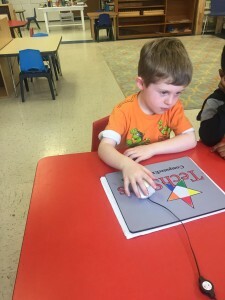 By way of background, they do some sort of computer programming at my daughter’s new kindergarten program. The feedback I got was that she has already exceeded expectations in this area and the teachers have asked me if she did programming before. Since I can barely turn on a computer – my guess it is thanks to you all and your hard work over the past few years and your program there that provided my daughter with such a strong foundation – kudos to you all! Last night, Leo and I were listening to clips of his uncle’s band and one of the songs seemed to be in Japanese. I said, “I don’t know this song. I think it is in Japanese.” Leo said, “I know the Japan flag is a red circle with white on this side and white on the other side.” So, now I know how he knew this very impressive information (your tech star update below)! Very timely and thanks for teaching him so well! He’s going to Miss Tech Stars when he starts at St. Ann’s in 3 weeks. We will, too! “Hi Rachel, Logan loves your class! It is one of the few things he will talk with me about from school. I wanted to let you know that I have signed Jackson up for the next session of classes. He was very happy that I did that and he has been loving the classes. Thank you for the weekly email updates. I share them with our family and they really enjoy seeing what Jackson is learning. “Thank-you so much for taking time with Nicole today. She has been carrying her turtle around all day:). I also wanted to let you know that since starting the class Nicole has become very good with using the curser keys as well as the mouse. She always looked forward to coming to class.